Les Crimes de l'amour, Nouvelles héroïques et tragiques (Eng: The Crimes of Love: Heroic and tragic Tales) is a collection of short stories by Sade first published in 1799. In its original publication, each story was prefaced by a motto from Edward Young's Night Thoughts. The collection also features the notable essay, Reflections on the Novel, which features Sade's theories on the 'modern novel'. Les Crimes de l'amour is also the title of a French film edited from The Crimson Curtain, a short story by Jules Amédée Barbey d'Aurevilly. 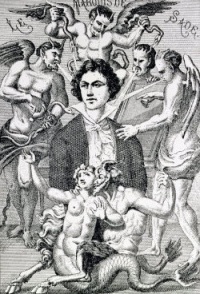 October 22, 1800 - In Le Journal des arts, des sciences et de littérature, an article by the critic Villeterque appears, violently attacking Sade's Les Crimes de l'amour, which has just been published. In the article Villeterque refers to Sade as the author of Justine. Unless indicated otherwise, the text in this article is either based on Wikipedia article "The Crimes of Love" or another language Wikipedia page thereof used under the terms of the GNU Free Documentation License; or on original research by Jahsonic and friends. See Art and Popular Culture's copyright notice. This page was last modified 18:03, 5 October 2014.